olar leasing programs are sweeping the USA–including Pennsylvania–and making it easier than ever for households to install solar panels on their roofs. What makes solar leasing deals so attractive is the fact that they enable homes to save money on their power bills by generating their own solar power by installing a system at no up-front cost to the homeowner. This article is an overview of the benefits of going solar in Pennsylvania, as well as the options available to Pennsylvanians who are considering going solar–including solar leasing as well as system purchase. Why should Pennsylvanians switch to solar power? The reasons that a Pennsylvanian might consider installing a solar panel system really fall into 2 categories: 1) The personal & financial benefits of doing so, and 2) the broader social & environmental benefits of doing so. The main reasons that the popularity of solar panels has skyrocketed in recent years are the declining cost of solar photovoltaic (PV) technology and growing government support–on both the state and federal level. Thanks to these things, solar panels are now more affordable than ever to install, which means that the power that they produce can be less expensive than purchasing power from the electricity grid. 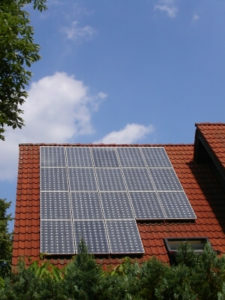 This means that homes that switch to solar will actually save money on their power bills. From an environmental perspective, solar panels are a great option for Pennsylvania residents because they do not require fuel and do not produce any sort of pollution while they generate power. This is especially compelling for PA residents given the fact that the state’s electricity generation infrastructure is some of the most pollution-intensive in the country, coming mainly from coal-fired power plants. In addition to the carbon dioxide emissions, there is also the issue of the negative health impacts that the processes of mining & burning coal have on human health. The more PA homes that go solar and/or switch to a clean energy provider, the better off the state is with regard to these impacts. What options are available to PA homes that want to go solar? Pennsylvanians who make the choice to go solar essentially have 2 options: Purchase a solar system or have one installed through a ‘solar leasing’ program such as the one that Community Energy offers in partnership with SolarCity. Thanks to innovation in the financing sector by companies like SolarCity (the USA’s largest installer of solar panels), it is possible for homes and businesses to install solar panels at no up-front cost. This means electricity price stability and power bill savings without spending your savings or taking out a loan. Under this arrangement, you’ll pay less for the solar power than you will for the power you purchase from your utility company. These arrangements, typically referred to as ‘solar leasing’ programs, have been a key enabler in the USA’s solar boom–and the option is now available to Pennsylvania homes as well. Customers who opt in to a SolarCity solar leasing program have the option to pay as little as zero down to have a system installed, but may also choose to pay any amount up-front to get an even better deal on their ongoing solar power payments. Those who wish to own their solar system stand to save even more money over the 20 year+ course of its lifespan. Every unit of electricity that you produce with your solar system is a unit less that you’ll need to pay on your power bill. Typically, a solar system purchased outright in Pennsylvania will pay itself off in less than 12 years.